Nothing makes me think of summer more than coconut. Whether it’s the smell of coconut- infused suntan lotion or the taste of a pina colada, the presence of coconut signifies sunshine, warm weather and fun. But coconut is more than just a sign of summer or the hallmark of a winter vacation somewhere warm: it is one of the healthiest foods you are probably not eating (or drinking!). Coconut is rich in vitamins, minerals and fiber and it sustains about one-third of the world as a functional food: one that yields numerous health benefits even beyond its nutritional benefits. Today I want to look at some ways you can incorporate this powerhouse of nutrition and wellness into your diet beyond cracking one open and eating its nutritious meat beyond shimmying up a tree (or over to the grocery store) to crack one open and eat its nutritious meat. Saturated fat has been labeled as a villain, but the truth is that the body needs high-quality saturated fats to perform necessary functions. In previous newsletters, we have talked about how the quality of meat and dairy has declined; they are now full of pesticides, hormones and antibiotics and are depleted of many nutrients. But coconut oil is a healthy saturated fat that has been proven to benefit heart health and even helps kill viruses, bacteria and fungi in the body. The difference between coconut oil and many other fats and oils is its size. Most all (an estimated 98-100%) of the fats and oils we typically consume are long-chain fatty acids or LCFA. But coconut oil is a medium-chain fatty acid, or MCFA. Our bodies metabolize each fatty acid chain size differently, so the effects of coconut oil in our bodies are very different than the traditional meat, milk, eggs and plants we consume that are made up of LCFA. Coconut oil is a saturated fat that has tremendous health benefits to us and offers a form of fatty acids we don’t typically find in our diets. Coconut oil actually regulates blood cholesterol levels as well as triglycerides; therefore, it actually helps with heart disease prevention and treatment. Coconut oil also helps to prevent the oxidation of cholesterol. And it has been shown to be effective at lowering lipoprotein(a). Coconut oil also has an antimicrobial effect in the body and can be used to treat bacterial infections including even severe antibiotic resistant strains. By eliminating and healing bacterial or viral lesions on artery walls, we can prevent inflammation and the barrage of white blood cells that can accompany it. 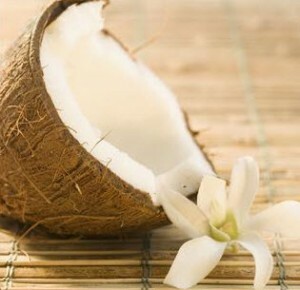 A study in clinical biochemistry confirmed the benefits of coconut oil on heart health. The study proved that virgin coconut oil lowered very low density lipoproteins (the troublemakers), raised HDL, lowered triglycerides and phospholipids, and reduced total and LDL cholesterol levels and was shown to inhibit LDL oxidation. The study concluded that we know that oxidized cholesterol can initiate the process of atherosclerosis and the fatty acids in coconut oil prevent this oxidation. The effects of coconut oil on heart health were deemed uniformly beneficial. So why haven’t you heard much about it? Coconut oil became the victim of government and food organizations about thirty years ago in an attempt to minimize importation of the oil and get consumers to buy American corn and vegetable oils instead. Because coconut oil is a saturated fat, it was easy to latch onto the anti-saturated fat bandwagon and drag coconut oil along with it. But an abundance of research shows that we need saturated fat (in moderation) to perform healthy body functions and that extra virgin coconut oil is one of the best and healthiest options for that. It has been called the healthiest oil on earth by some and has been a foundation of the nutrition of numerous cultures for thousands of years. Even though my family does not care for the taste of coconut, we find coconut oil non-offensive. It actually adds a nice flavor to a vegetable sauté and we cook with it often. My daughter, who wouldn’t eat a Mars or Almond Joy candy bar for all the money in the world because she doesn’t care for that kind of coconut, will even eat it out of the jar with a spoon when she’s hungry. Her growing body sometimes craves saturated fat and she listens! Coconut oil is heart healthy and can help you regulate lipoprotein imbalances. Adding some to your diet, especially in lieu of dairy or hormone-ridden meat, is a great option. Another option beyond cracking open a coconut and eating the meat is to add some coconut milk to your diet. Coconut milk is also proven to improve cardiovascular health, balances electrolytes naturally, and also has antimicrobial properties. Coconut milk is commonly used in many cultures including Vietnamese, Cambodian, Indian, Indonesian, Thai, Brazilian, Caribbean, Polynesian and Pacific island cuisines and serves as the foundation for many curries. Coconut milk can be made to be thick or thin, depending on your preference and what you are using it for. Coconut milk is made by squeezing grated coconut meat through cheesecloth. The meat is then soaked in warm water. The thick version makes desserts and rich sauces. To use it in soups and for general cooking, a thinner version is made by repeating the squeezing and soaking process 2-3 times. If you are not making it yourself, you can buy it canned, which is usually a combination of thick and thin versions using water as a filter. Once opened, the canned version lasts only a few days before souring. Fresh coconut milk tastes very similar to cow’s milk and when made well should have little to no coconut smell. You can drink it “raw” on its own instead of traditional dairy or use it as a milk substitute in coffee or tea; it can also be used in baking and can even be used to make a yogurt substitute. It’s a great and healthy dairy alternative for vegans as well those with animal milk allergies or those just looking to reduce dairy or try new sources of liquid nutrition. Finally, another way to add some coconut goodness to your life is through coconut water. Coconut water is simply the water that comes from inside the coconut. It is full of vitamins, minerals and electrolytes. It has a faint coconut taste, but is not overpowering. Because of its nutritive content, it is an excellent alternative to sports drinks made with sugar (or sugar substitutes), chemicals and dyes, none of which we – and especially our kids – should be consuming. Coconut water will naturally re-balance electrolytes and replenish losses after strenuous or sweaty workouts. My kids love it and take it to soccer games and sports activities. I keep some in my fridge at all times and find it a refreshing drink alternative when water alone isn’t calling to me. And I love that the brand I buy, Zico, which has nothing added and is just pure coconut water, comes in paper containers so I am not adding to the excess of plastic bottles we generate each year from bottled water and other drinks. Coconut water is a win-win option for healthy water alternatives and if you haven’t tried it yet, you should definitely give it a try. You can find it in most supermarkets and convenience store drink cases, as it is becoming increasingly popular as a nutritional drink option.